Emerald is a brilliant green member of the beryl family, which also includes aquamarine. 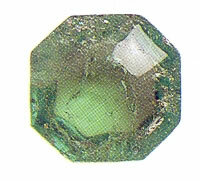 It is a beryllium aluminium silicate that gets its green color from the trace mineral chromium. Its hardness is 8 on the Moh’s scale, and it has a trigonal crystalline structure. The energies of Emerald are uplifting and healing, for they connect you with your source. Emerald can increase your awareness of abundance in other forms than purely monetary, and encourages gratitude when you are dealing with the issues of financial support. It can also contribute to your sense of feelings supported by Higher Guidance.